Here's Why People Were Mad When Apple Called Its Stores "Town Squares"
Apple senior vice president of retail Angela Ahrendts. 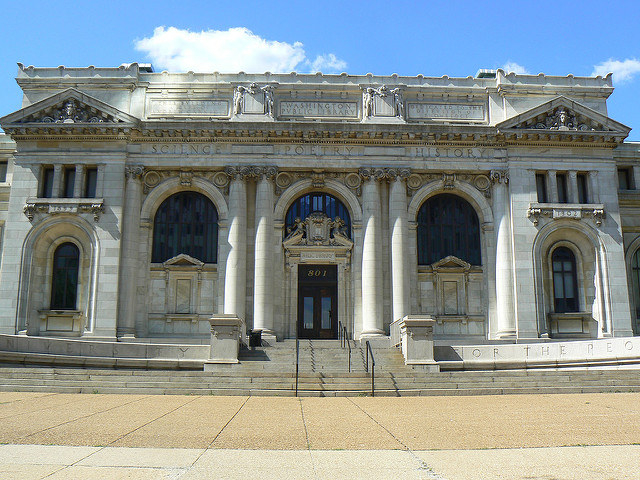 In 1903 the Carnegie Library opened in Washington, DC. The beautiful beaux arts structure was the first public building in the city to welcome people of all races and was “dedicated to the diffusion of knowledge,” as inscribed on its facade. It was funded by Andrew Carnegie, the Gilded Age steel tycoon who gave millions of dollars to build nearly 1,700 free public libraries across the United States. 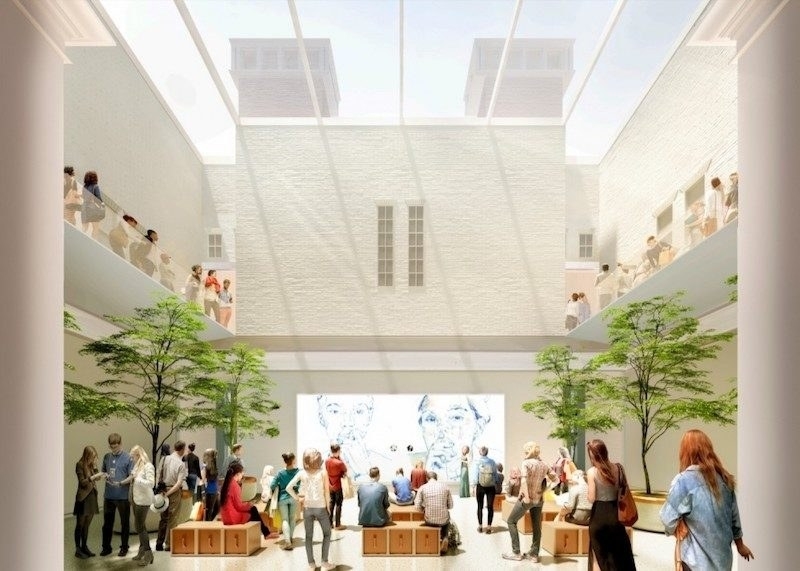 More than a century later, a large chunk of the DC building, no longer a library, is getting a second act as an Apple store — well, not a “store,” exactly. Twitter erupted at that comment. Many were rankled to hear an $815 billion multinational corporation equate a space synonymous with democracy with a store that sells $999 phones. But the use of the term “town square” illustrates something bigger than a questionable branding strategy by Apple. It highlights the tension in Silicon Valley companies’ increasing tendency to make their buildings — from their stores to their headquarters — look more open, more inclusive, and more like part of cities. It’s not just Apple. Facebook and Twitter have done it too. Projecting the appearance of transparency, but not always the reality of it, is how the tech industry sells itself to customers and politicians alike. Left, the Carnegie Library. Right, an interior rendering of Apple's store. Projecting the appearance of transparency, but not always the reality of it, is how the tech industry sells itself to customers and politicians alike. Long known for its glass-and-aluminum aesthetic, Apple is now adding a dose of urbanism to its flagship stores. The location that opened last year in San Francisco’s Union Square — an actual public square — contains the classic features of civic life: a plaza with outdoor seating, free Wi-Fi, and greenery inside and out (the Genius Bar is now a tree-filled Genius Grove). There’s a boardroom where local entrepreneurs can schedule meetings, and event spaces for music performances and “Today at Apple” classes on how to make the most of your Apple devices. Renderings indicate similar designs for future “town squares” in locations linked with civic life: in Chicago, overlooking the Chicago River; in a historic building on Paris’s Champs-Élysées; and beneath Piazza Liberty in Milan, Italy. If you wandered onto one of these plazas, you might not immediately realize you’d entered Apple territory. You might not even feel the need to buy anything. “Come in and relax, meet up with friends, or just listen to a local artist on the weekends,” Ahrendts said on Tuesday. Genuine, productive, and personally rewarding conversations and relationships can and do form in these settings, much as they would in real public spaces. Kayden says he’s happy to see the private sector create inviting spaces, even if they’re not the real deal. “Some people will prefer an Apple town square to a real town square,” he said. But there are limits to this apparent freedom, for the obvious reason that private property is private. Real town squares have been the backdrops for protests from St. Petersburg to Beijing to Wall Street’s Zuccotti Park. In malls, however, shoppers don’t have the free speech rights they do in the streets. In a 2015 case, for example, the Mall of America was found to have the right to remove Black Lives Matter protesters from its premises. Apple's flagship store in San Francisco. But Apple Park is a ring-shaped spaceship, a design that has been widely panned as isolated and exclusionary. There is virtually no connection to mass transit, aside from Apple’s own shuttle system — just thousands of parking spaces for more than 12,000 employees. “Apple’s new HQ is a retrograde, literally inward-looking building with contempt for the city where it lives and cities in general,” Wired’s Adam Rogers wrote. It “wraps its workers in a suburban setting, removing the feeling of a collective metropolitan realm,” Christopher Hawthorne wrote for the Los Angeles Times. While Apple talks about its campus as if it functions like a city, others have literally created their own cities. In 2011, when Facebook took over the former Sun Microsystems headquarters in Menlo Park, it revamped it into a “Disneyland-inspired” main street, with a plaza, restaurants, a café, a doctor’s office, a bank, a barber, and a video arcade, among other amenities. It had all the trappings of a bustling metropolis — but one populated exclusively by Facebook employees, with no chance of interacting with the community beyond. There are steps that tech companies can take to better mesh their buildings and workforces with the outside world. In a recent report on Bay Area corporate campuses, SPUR held up Yelp and Salesforce in San Francisco, Box in Redwood City, SurveyMonkey in Palo Alto, and Samsung in San Jose as examples of successful integration. Their buildings have ground-floor retail that’s open to everyone, for example, or are located near public transportation. “What happens if Black Lives Matter wants to go to the Apple store?" Google uses similar rhetoric in pitching a transit-centered “village” that would remake downtown San Jose with 6 to 8 million square feet of new offices, although it’s too early to know exactly how it will look. “Google shares the city’s vision,” Mark Golan, a vice president of real estate services for Northern California, told the city council in June. Facebook's original campus in Menlo Park, California, in 2012. If this civic-minded rhetoric leads to better urban planning, it’s to the benefit of cities, their citizens, and companies alike. At the same time, it’s part of the tech industry’s broader tactic to engender goodwill among lawmakers, consumers, and the public at large — despite its often uncivic behavior. Tech giants like to describe their missions in noble, inclusive language, like “every voice has the power to impact the world” (Twitter) and “give people the power to build community and bring the world closer together” (Facebook). They also harvest troves of consumer data to sell ads, act like (alleged) monopolies, hide their algorithms, evade billions in taxes, and operate largely in secrecy. That these companies are increasingly doing business in privately owned, public-looking spaces may seem like a separate issue from how they run their businesses. But their desire to approximate urbanism in fact reflects the broader contradictions in their outward-facing image: the desire to look like a good citizen, but not necessarily act like one.